I would like to thank the Graduate School of Geoscience for the start-up honours grant which provided me time for preparing a project proposal. I was working on a project application for the German Research Foundation (DFG). Within that project I will have the opportunity of doing my PhD. 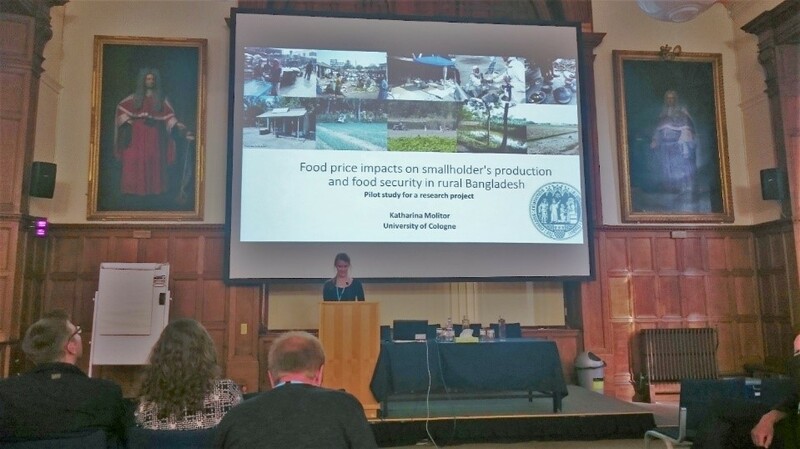 The project idea is about exploring the impacts of food price change on smallholder households in rural Bangladesh by understanding their decision-making processes and practices regarding their agricultural production and their household food and nutrition security. The project embraces to investigate the question why and how producers of food can become food insecure. During this funding period, I was able to do an extensive literature review. Within the first month I was working on the conceptual framework and reviewed the newest literature about Global Production Networks. Because I want to link value chain literature to the concept of Food and Nutrition Security and especially the access to food I was in search of similarities and reviewed literature about value studies and accessibility in Economic Geography. Furthermore, because the results of my master thesis as a preliminary study of this project has shown that social networks are important for smallholder to support food consumption of households directly in the network, I was interested how this works for the agricultural production and market connection of smallholder farmers as an indirect way for food security through economic access to food. So, I studied the concept of Social Capital because little is known about that with regard to the power relations of the value chains actors. In the next period, I was in search of adequate methods for the study. Therefore I studied the debate of practice theory which gained recently much attention. On that basis, I mapped out the methodology and integrate the investigation of practices of smallholder and intermediaries into a mixed methods approach of qualitative and quantitative methods. Within the funding period I was able to present the first conceptual ideas at the Fourth Global Conference on Economic Geography in Oxford (UK) this year and also in the Colloquium of environmental oriented Economic Geography of the Universities of Cologne and Luxembourg. The application will be submitted before Christmas. Until then I will review literature about the role of intermediaries in value chains because this is the last conclusive step for the value chain analysis. I also want to update the literature review with regard to recent publication on impacts on food prices on smallholder. Within the funding period of the GSGS I have been working on a paper where I can publish the results of my master thesis. 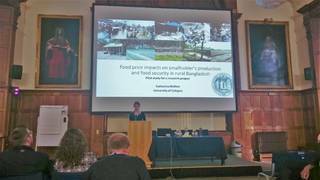 Additionally, I will work on a paper for a Special Issue of the Geographical Research on “Food and nutrition insecurity in the Global South: Geographical perspectives” until February 2016. In the end, I would like to thank Professor Boris Braun who is the proposal applicant and who gave me the opportunity and supports me preparing this application, and Professor Bill Pritchard for constructive discussions during his stay at the Institute of Geography during the last month. Within that proposed project I would have the opportunity to work on my PhD thesis under their supervision.